There is nothing quite like the sounds of children having fun. Over the years I have visited kids living in the most extreme conditions — from the IDP camps in Darfur to the slums of Kolkata to the steppes of Mongolia and other places around the world. Somehow, kids find a way to laugh and giggle and to entertain themselves in spite of the poverty that surrounds them. They demonstrate a remarkable resiliency and capacity to adapt to life with little or nothing. The kids we have worked with this week in Poipet are among the poorest I have seen. They live in ramshackle hovels on unpaved roads covered in slimy mud during the rainy months. 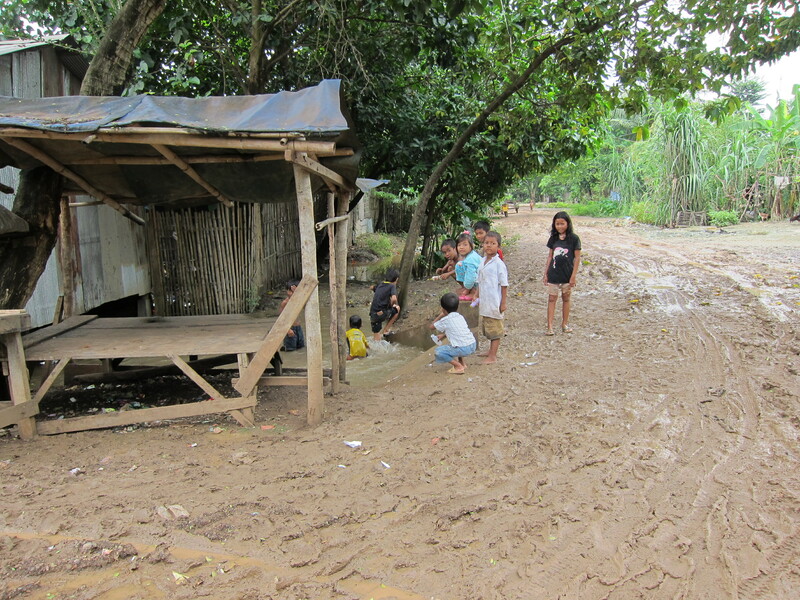 We are here in the middle of the rainy season and I have never seen so much mud in all my life. I can’t imagine living in these conditions for months at a time much less for a lifetime. But, in spite of these wet conditions, kids are kids — and mud and murky brown pools of water offer opportunities for fun and adventure. Today was our final day of our Vacation Bible School at the Imparting Smiles orphanage in Poipet. As expected, even more kids showed up this morning in bare feet, some in bare bottoms, but all of them expecting to have a great time. Every square inch of the Imparting Smiles campus was covered with mud and laughter. At the conclusion of our session this morning, we invited the kids and their parents to stay for a meal. 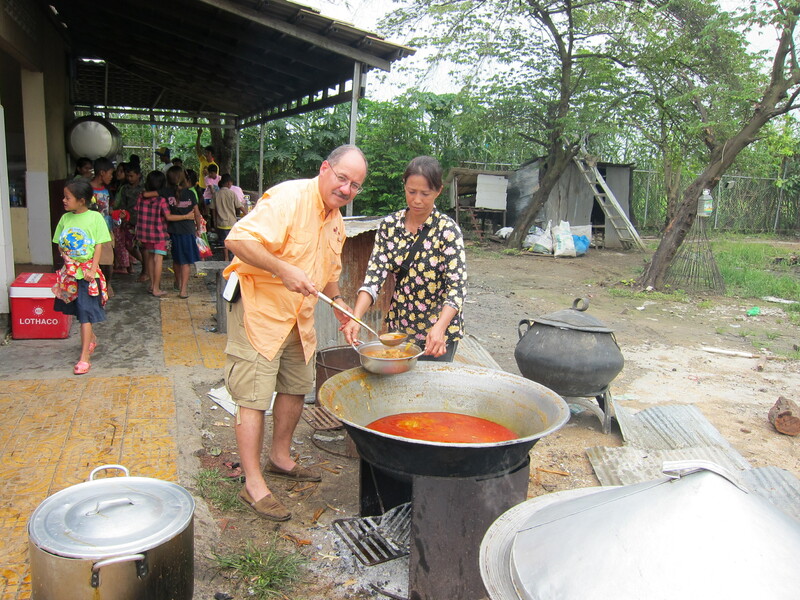 The cooks at the center prepared mounds of white rice and a local favorite — some kind of chicken soupy dish that contained absolutely every part of the chicken, including the feet (a favorite delicacy). The only thing I can compare it to is South Texas menudo, a tripe stew that I never learned to like. For the vast majority of those present, this was one of the few times they enjoyed a meal with any kind of meat. Most of the poor people in this area can’t afford meat so their diet consist of mainly rice and vegetables. I was a little amazed at how many of these kids took the time to say thank you for the meal, something we don’t often hear from our kids in America. The mayor of Poipet and a representative from the governor’s office attended our closing VBS ceremony. At the conclusion, these Buddhist men spoke to the kids and encouraged them to continue learning about Jesus. Turning to Steve Hyde, one official said, “Your God is bringing hope to our region.” And then he turned to the kids and told them to keep coming to the Imparting Smiles campus any time they offer community events like this. He also encouraged them to learn more about this God who gives hope to all people. What an amazing sign of favor. I was reminded of Proverbs 3:3-4, one of my favorite Bible passages: “Do not let kindness and truth leave you; bind them around your neck; write them on the tablet of your heart. So you will find favor with God and man.” Finding favor with man is the result of intentionally demonstrating God’s love to others in personal, practical, and measurable ways. As someone once remarked, “I don’t care how much you know until I know how much you care.” May we always allow God to use us to show the world how much He cares and how much He loves. What a wonderful answer to prayer. God is so good!! Amen! I found out that one of the government officials was himself an orphan who suffered terribly under the Khmer Rouge — an experience that has given him a tender heart for orphans. He is a good man who seems to care deeply about the plight of the poor children in his province. One other wonderful thing came as a result of meeting the government officials, they made phone calls and invited us to visit another Christian orphanage about 1 1/2 hours away from Imparting Smiles. More precious children of our God and King. It was beautiful to watch the children sing of Jesus; especially with the Officials present! Our Lord is at work…..even while the chanting of the Buddhist Festival begins at 3:15 am (not a typo)! Yes. A full and fulfilling day, indeed. Thanks Pastor. I love this true story which you have written. I agreed with you the world does not care how much we know unless they know how much we care. I also want to say thanks for you and your team to come away from home and family to be God’s vehicle of love and hope for Cambodian children. As in Proverb. I pray that God’s favor be upon all of you and all of your family. Thank you for translating for our team and for all of your help with our VBS. 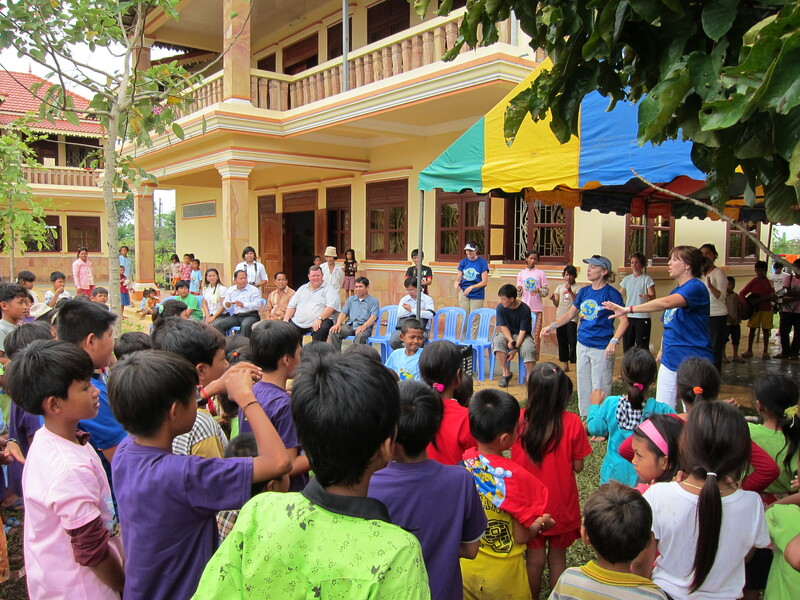 You have helped to make our time in Cambodia more fruitful and enjoyable. We love and appreciate you. Wow, what an amazing story. It gave me goose bumps when I read about the Buddhist men encouraging the children to learn more about Jesus and how they said “your God” was bringing hope to the region. Wow, what a mighty God we serve. Nothing is impossible for “our God” 🙂 Love it, love it, love it!!!!! I also love how the children were so thankful! Thanks to you and the ladies for loving on these kids!!! It was a great day, Beth. And it was made even better when we heard the words of the visiting officials. Amazing! Hurry home everyone & tell us more!! Missing y’all!! I echo Beth’s words! What an amazing story! I love the Name “Imparting Smiles” and can visualize these kids playing, singing, smiling! What a blessing it had to be for everyone of you to witness and what a blessing to them to have all of you! Thank you for you writings!